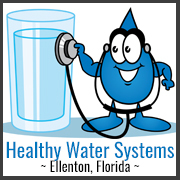 Healthy Water Systems (HWS) sells, installs and services residential and commercial water treatment systems. HWS utilizes the newest technology to provide its customers with the cleanest, safest, and best-tasting water whether it comes from a well or from your tap. Whether it’s installing new equipment or servicing existing equipment, the HWS staff will make recommendations to satisfy every customer and meet every budget. Have your water tested for free! Read more about common water quality problems we encounter here in Florida. Iron Zapper water systems effectively treat iron, hydrogen sulfide and manganese in your water. Using a chemical-free process, the control valve introduces air to the filter’s tank for increased oxidation. Next, the filter media acts as a catalyst to provide greater oxidation because our media has more active ingredients. Green Treat two-tank water system is good for the environment and good for you. Tank one removes harmful chemicals using an NSF-certified activated carbon, and removes chlorine, bad taste and odors. Tank two removes water hardness using an ion exchange process which prevents scale buildup in your water heater, dishwasher, coffee maker and other hot water appliances. It’s great for whole house filtration and conditioning, using no salt, no wasted water, no electricity and no drain. Reverse Osmosis (RO) is an effective method of disinfection for well water. Our reverse osmosis system uses a six-step filtration process that reduces the most harmful drinking water contaminants: chemicals, metals, salt, TDS, chlorine, foul tastes, odors, fluoride, arsenic, lead, sediment and more. The system comes with quick change cartridges, an NSF-certified 75 GDP membrane, a plastic storage tank, faucet and valves. 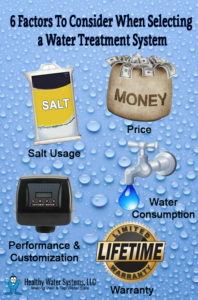 Price & Performance - Nobody beats Healthy Water Systems for price and performance. We offer top-of-the-line equipment and affordable prices – in fact, we will beat any competitor’s written quote by at least 20%. Salt Usage & Water Consumption - Our electronic metered valves typically use 40-60% less salt and 57% less water per regeneration compared to mechanical metered valves. Customization – Our valves have fully adjustable cycles so we can make adjustments to meet your specific requirements. Warranty – Healthy Water Systems offers the best warranty in the business including lifetime on mineral tanks, seven years on control valves and five years on brine tanks.